TOKYO (Reuters) – Tokyo’s core consumer price inflation was unchanged in October from the previous month, government data showed on Friday, offering little encouragement for Japan’s central bank as it struggles to reach its ambitious 2 percent inflation target. The data comes ahead of the Bank of Japan’s rate review next week, when it is set to monetary policy steady and maintain its optimistic view on the economy even as global trade frictions and volatile markets cloud the growth outlook. The core consumer price index (CPI) for Tokyo, a leading indicator of nationwide price trends, rose 1.0 percent in October from a year earlier, matching a median market forecast. The pace of gain in the core CPI, which includes oil products but excludes fresh food prices, was unchanged from September and driven largely by rising energy costs, the data showed. The so-called core-core CPI, which strips away the effect of both energy and fresh food prices, rose 0.6 percent in October after increasing 0.7 percent in September. “The boost from energy costs will start petering out from November. Core-core CPI also appears to be stalling,” said Koya Miyamae, senior economist at SMBC Nikko Securities. The BOJ issues its inflation forecasts using core CPI figures, but has been recently looking more carefully at core-core CPI as a key measurement of demand-push pricing pressures. Inflation has remained well below the BOJ’s 2 percent target despite Japan’s steady economic recovery, forcing the BOJ to maintain a massive stimulus despite the rising costs such as the hit to bank profits from years of near-zero interest rates. Some analysts warn that Japan’s economy may have contracted in the third quarter as a string of natural disasters disrupted supply chains and factory output. Bad weather during the quarter also hurt crop and pushed up vegetable prices, which could depress private consumption by discouraging households from boosting discretionary spending. 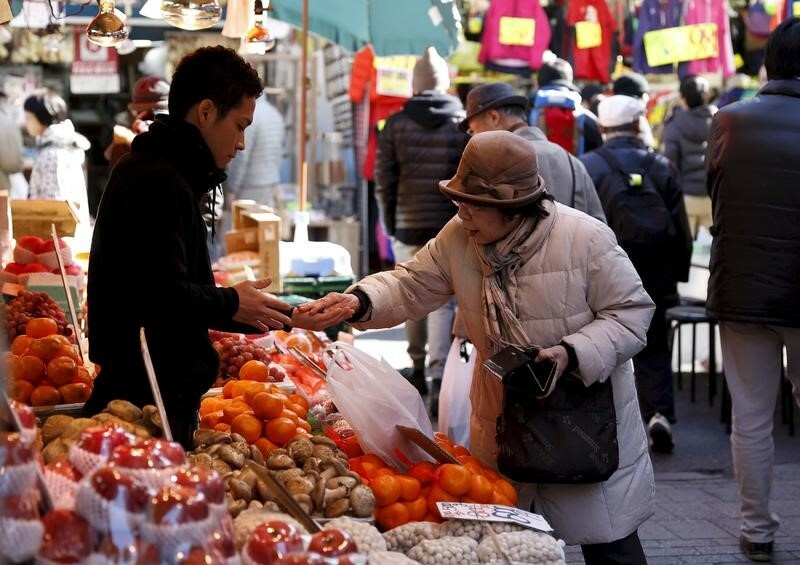 Tokyo’s overall CPI rose 1.5 percent in October from a year earlier, marking the highest increase since March 2015, as vegetable prices surged 23.4 percent, the data showed. “Private consumption lacks momentum, so companies will remain cautious of raising prices. It’s hard to be bullish on the outlook for core-core CPI,” said Yoshiki Shinke, chief economist at Dai-ichi Life Research Institute.